Creating in Colour: Switching On, Or Switching Off? Switching On, Or Switching Off? There’s a storm brewing, and I think we’re in for a pretty rough weekend. I don’t mind the bad weather, so long as I don’t have to go out. It’s pleasant to sit in the house, looking out at the trees getting tossed about; staying in gives me an excuse to get on with some work, too. It’s been a busy week, but I’ve managed to complete a few projects and start a couple of new ventures as well. I had another mini clearout and discovered some old sketchbooks. The paper quality isn’t great. However, I've decided to fill at least one of them with lines – just lines and as many variants of lines as I can think of. I began a few more mandalas, and although I enjoy designing them, I prefer working looser with no pencil marks to guide me; so, I think that’s how I’ll be working over the next few weeks. Tracey@Hotchpotchcreations asked me last week if I create my mandalas to ‘switch off or switch on?’ I’ll do my best to give an answer, but if I’m honest, I’m not sure I know. When I’m writing, I really tune into the process of putting words down. I like quiet so that I can think about what I’m writing and so that I can reflect on previous sentences. When I’m drawing, however, I'm usually listening to loud rock music. I tend not to focus and let my pen go where my mind takes it. I suppose it’s a form of switching off. Then again, when I’m drawing mandalas, I find I have to concentrate very hard on where each line is going. So that could be switching on. I think that's why I prefer working without guiding pencil lines. Switching on or switching off, depends on what I’m working on. I hope that answers your question, Tracy. Well, here’s this week’s offerings. I hope you like them. Hope the storm won't be too bad. Hi, Valerie. Thank you. Oh, if this storm hits, I'll have lots of fun drawing. Wow on today's offerings! Interesting and thoughtful answer to Tracey's question. We are hunkering down in Toronto's icy weather right now. Thank you, Christine. Oh, I'm sure it's cold there. Lots of hot vegetable soup on the table. I love the detail you put into your drawings. I sense you are in the "zone" when you draw these exquisite pieces. Enjoy the storm! I love storms, too. Hi, Beth. Not sure where I am when I'm drawing - I'm just drawing. I love watching storms, being out in them is a different matter. Hi, Tarang. Thank you. I think that's part of the pleasure of doing mandalas - sometimes they are difficult. But I like a challenge. Glad you like my photo. It's a local scene. I took it a few days ago. your designs are so meticulous and flowing John, they always make me really look and think "wow" ! Happy PPF! Hi, Linda. With all these compliments, I'll be getting a big head. LOL. Thank you for your kind words. Thank you, sirkkis. Very much appreciated. It's going to be a wicked weekend for waether! Hi, Jenn. Thank you for visiting and for your kind comment. The wind is howling round the house at the moment. Goodness knows what the next few days will bring. Hi, Susan. Thank you for commenting. I reckon it's because when we are writing we do it conciously, but when we are painting/drawing the subconcious takes over. 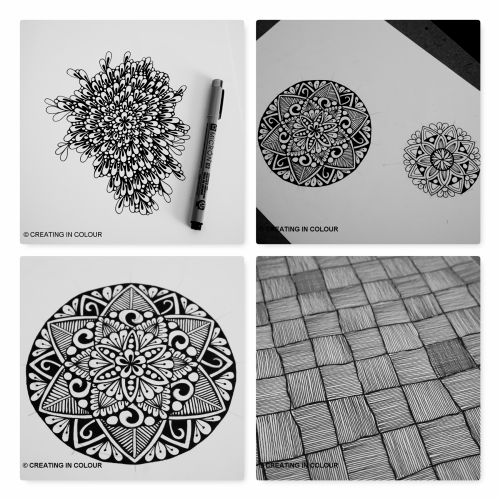 Love the image on your post, and I always like to see your mandalas, your designs look great. Out in the car earlier and it was very wet and windy, apparently it's Storm Erik who is to blame! Thank you, Jan. The image is a local scene; one of my favourite places to visit. Oh, Erik is well and truly here, already a few trees blown down. Answered perfectly John like a true artist, there really is no on or off answer as it only takes one thing to stop and start those sparks that trigger creativity. Beautiful work as always, hope the next creative instalment flows as freely and the storms ahead pass quickly. Thank you, Tracy. I guess it doesn't matter what field of creativity you are into, you just do it because it's what you do. Beautiful pieces. I find the top left one intriguing. Thank you, June. The top one is in progress. I'll post a new picture whem it's finished. Hi, Cindy. Thank you for visiting and for your kind comment. That weave pattern was just an idea that popped into my head, while filling up some old sketchbooks. All your patterns pleases the eye. But I don´t think I could ever create one :) In some way I envy you. Thank you, NatureFootstep. I think you could create them just fine. It just takes a bit of practice.